That's what I get for reading Reddit. Reddit gives you Ideas. Ideas can be what you make of them. In this case, I made a "Za" and I liked it. Any group tends to have their own slang. I got started reading the "Subreddits" on some of the food subjects. Specifically, the Pizza Subreddit. Occasionally they have a recipe for crust, but I've got an excellent one that I've posted on here. But reading onward, I got a laugh at their shorthand for "Pizza" - a "Za". In my own mind, it was cute and silly but I did tend to reserve it for something that wasn't quite a pizza but was somehow. I got this bright idea one day when rooting around the refrigerator and came up with some oddball ingredients. Now, mind you, this thing really is a Quesadilla. The spices are "wrong" but I wasn't going to have Mexican Food, I wanted Italian. To cook it, I turned the heat on the non stick skillet, put about a half teaspoon of olive oil on it, removed most of the oil with a paper towel to grease the pan, and set the heat for 4 and a Half - on a scale of 8 on the electric burners. You want a medium or "low medium" heat since these things cook fast. When it warmed, I slid the concoction onto the skillet and warmed it until the bottom began to toast to a light golden brown. It was still flexible so it slid easily onto a waiting dinner plate. The Tortilla would cool and firm up to a cracker texture as it sat. While it was cooking, I made a second one. What happened was probably one of the better pizzas I have ever had, including the ones I make from my own thick crusts. Prep time about 3 minutes including measuring everything on my kitchen gram scale. David had arrived a couple days back. When we were riding back from the airport, he told me that wanted to go to a Chinese Buffet some time during the visit, to which I readily agreed. We went the next day and all of us were stuffed like a sausage - over full and unable to move. Truly an episode of excess. But the next day we needed lunch. We all skipped breakfast that day. When I brought up food to David, he said that he wanted something small. I should make you a 'Za'. Small pizza on a tortilla. Go ahead, I'll trust your judgment. David is British, even after living in Key West for 30 years. Decidedly British. That is a good thing but he doesn't have too much experience cooking oddball things like that "Za" that I tried to describe. David, it is 300 calories, measured. Each. I have two and it's a "rightsized" meal, although a little on the light side. He agreed since I said I was making one and he could try the first. Since the process is prepare one, start it cooking, and prepare the second, I started. 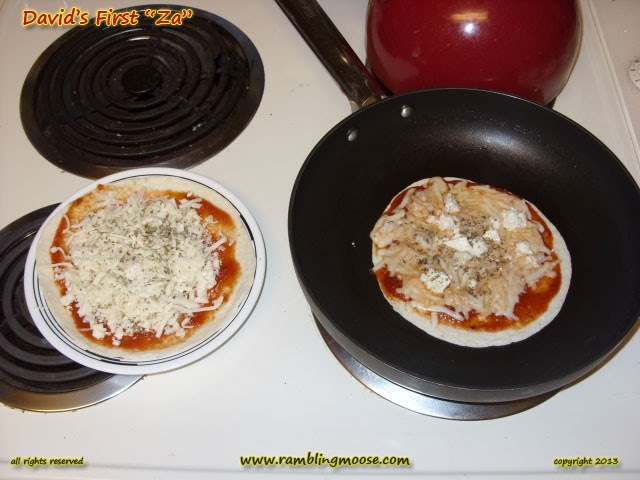 When the second is finished, the first can come off of the skillet - they only take about 3 minutes to cook and get the cheese just beginning to bubble. You could do the cooking in a toaster, but the olive oil on the skillet adds a little flavor that you need. The first Za was cut into quarters and served while I went back to work with making the third and cooking the second one. I heard from the living room: "Bill this is amazing! It's one of the best pizzas that I've had in a very long time!". David liked it. Quite a lot. In fact he got up to watch me prepare the fourth one later. So the moral of the story is that you can be creative and play with your food. Your British Friend may just like it!